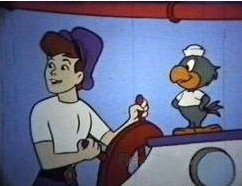 Sinbad Jr. and Salty his Parrot fighting Pirates on the open seas. Pirates on the open seas. fighting the works of evil. with his support and ever funny remarks.